Every year, I make my dad a pecan pie, his favorite. Still, I like to change things up as well, so every year, I use a different recipe. Last year, I made a pecan pie with molasses that came out extremely well, but what to do this year? I usually spend a few weeks reviewing recipes and looking for the variation that appeals, but this year, I didn’t find the one I wanted until two days before I was due to start baking. I had barely enough time to do the shopping! This year, Kevin at Closet Cooking posted a link back to his post on Maple Pecan Pie which he did last year in Thanksgiving Ideas post. When I saw the title, I knew I’d just found my pie for this year. How could I resist swapping out corn syrup for maple syrup? It sounded perfect. Plus, Dad loves maple syrup, so it was definitely a win-win. I’m not a huge fan of pecan pie, so I usually don’t miss not having a slice. This time, however, the remains of the filling in the bowl were so good, I wished I’d made two pies — or at least some mini pies for myself and my husband. It was that good. In fact, this time, I really didn’t alter much. It was almost perfect as written and I only tweaked it slightly. I just wish I’d had enough filling left over to make myself a mini pie! Well, Dad, my secret ingredient in my pie crusts is not so secret. It’s lard. Real, honest-to-goodness, made-from-a-pig lard. Do not, on pain of death, substitute Crisco. Please, I’m begging you. As always, the pie crust I use is from Alton Brown. You can find it on FoodNetwork here. Pecan pies do not require blind baking, so you need to stop at the point of lining the dish with the dough and come back to this recipe. I promise, this recipe is definitely a must for your holiday baking list this year. Preheat the oven to 350F. Spread pecans out into a single layer on a cookie sheet and toast them for about 8 – 12 minutes. They should darken slightly and give off a wonderful toasty-pecan scent. In a medium saucepot, heat sugar, syrup and butter to a boil, stirring constantly. Allow it to boil for 30 seconds and then remove from heat. Pour off into a medium bowl so it will cool faster. Beat together in a separate bowl the eggs, cream, vanilla extract and salt. You can temper the eggs by pouring in a little bit of the syrup into the eggs and beating well. Or wait for the syrup to drop to about 100-110F and beat everything together then, which is what I did. Arrange the toasted pecans on the bottom of the pie crust. Pour the egg-syrup mixture over them carefully. Bake for 40 – 50 minutes or until a toothpick inserted in the center comes back clean. Edited on December 2: I guess I should have posted the German Chocolate Pie first and saved this one for today. Still, I’ll submit this for participation in the Tried and Tasted Event hosted by Salt to Taste because frankly, it’s a great dish and I’m glad I found it. This entry was posted in american, pie, recipes, untranslated. Bookmark the permalink. Your pie looks so good! I am so craving it again right now. 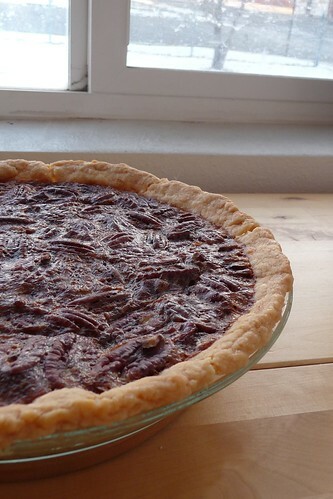 Glad you liked Kevin´s pecan pie :-) I hope you re participating this month¨s cooking challenge too. We have almost 10 more days to go … this month, we are cooking from Akal´s Saappadu, hope you like. More info here. Hi! Thanks for the info – she has some great recipes to try.